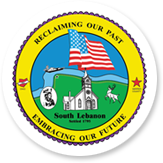 The Village of South Lebanon Board of Zoning Appeals will hold a public hearing on Wednesday, November 14, 2018 at 6:00 p.m. in the Council Chambers located at 99 High Street, South Lebanon, Ohio 45065. The purpose of the hearing is to receive public comments on an application for a variance of 1.9’ to the minimum rear yard setback on Lot #65 in the Riverside Phase 2 subdivision in the Village of South Lebanon. Interested persons may appear and be heard with respect to the proposed application. Comments may also be submitted in writing to Jerry Haddix, Administrator, 99 High Street, South Lebanon, Ohio 45065 or emailed to jhaddix@southlebanonohio.org.